Long Neck Elementary School Dictionary Project – all third graders receive a dictionary. Rotary Reads with Long Neck Elementary School – all students are given the opportunity to select two free books and a special book project is held twice in the school year for 4th and 5th grades to promote literacy. 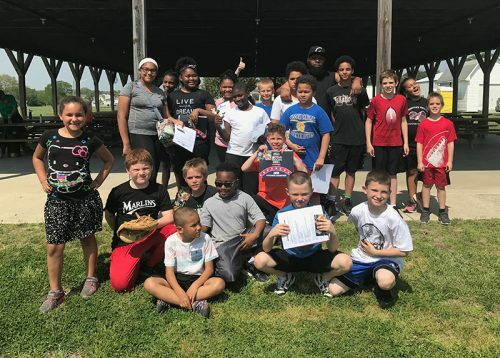 Oak Orchard Boys and Girls Club Major League Baseball Pitch, Hit and Run Program – boys and girls participate in contests where winners can advance to regional and state competitions. Oak Orchard Boys and Girls Club Celebrating Youth Program – children who may never have a birthday party are treated to birthday cake, balloons, and gift cards to commemorate their special day. Rotary Youth Leadership Awards – annually enables 3-6 students to attend a weekend camp where they develop leadership skills. a high school senior planning to attend a public or private college, business or technical school for the upcoming academic year. It is not required that the school be located in Delaware. Completed applications must be submitted to the School Counseling Office at your school by March 15, 2019. We anticipate that final decisions will be made sometime prior to the Annual Senior Awards Ceremony in May 2019. Download your application at left. NOTE: These are interactive PDFs that you can complete on your computer. Download the file to your computer, complete and return to your guidance office as instructed.